Classic Construction – Thick framing is the most distinguishable element of the French door. Its old-fashioned stile and rail construction joined by mortises and tenons is a relic of the past from centuries ago. It matches the aesthetic of traditional architectural styles, lending Old-World charm to your space. With better hardware designs, security features and glass innovations, the French doors of today combine classic craftsmanship with 21st-century technology. Abundant Access – Hinged French doors can be installed in most wall openings, including those with gliding units. Able to swing inward or outward completely, they provide easy access, which is convenient when moving bulky furniture and allowing heavy traffic into and out of your home. Low-Profile Threshold – Since hinged patio doors have no track to glide on, they’re easier to step over. A pronounced track can be a tripping hazard. Space-Saving Design – Sliding doors don’t need any room to operate. They let you maximize your floor space to place more decor and provide wider pathways. Because they move sideways, they won’t interfere with high-traffic areas. Large Glass – The narrow framing of sliding patio doors lets you get maximum glass area. In turn, they can capitalize on wonderful panoramas to enrich your interior design. If you have a tiny room, they can make it feel less cramped because they stretch the gaze to the outside world. Effortless Operation – With proper maintenance, sliding doors can continue to open and close with little effort. 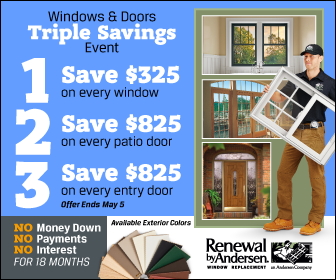 When your foundation shifts, they are easy to adjust to ensure smooth operation.At Renewal by Andersen of St. Louis, our French doors have a sliding version to offer the best of both worlds. Call us at (314) 332-2364 today to learn more about our door models and customization options, and get a free estimate in St. Louis, MO.